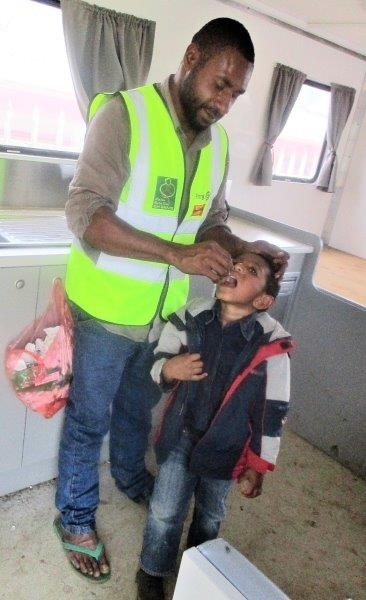 The fifth round of the nation-wide polio vaccination program for children aged five years and below started on Monday, 8th April and will end next Tuesday, 22nd April 2019. 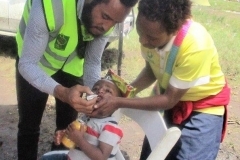 While most provinces are concentrating on the polio program alone, there are some that are using the opportunity to carry out integrated Supplementary Immunisation Activities (SIA) to save cost and also protect children from being infected by other preventable diseases. 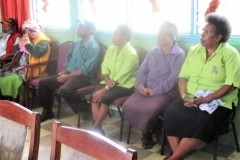 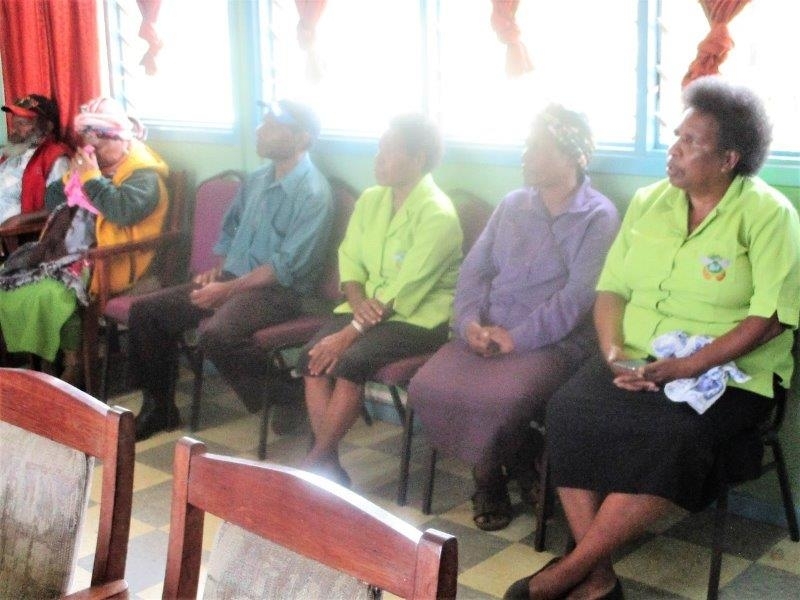 The Western Highlands Province is one of those where the Provincial Health Authority is carrying out the integrated SIA in all the four Districts to safeguard all children. 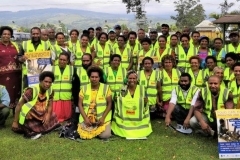 As a start, the Provincial Emergency Operation Centre (PEOC) held a meeting on 2nd April at Hotel Kimininga with District Health Officers, facility Officers-In-Charge and Sisters-In-Charge as well as representatives of Church Health Services and Non-Government Organisations to draw up a micro plan for the exercise. 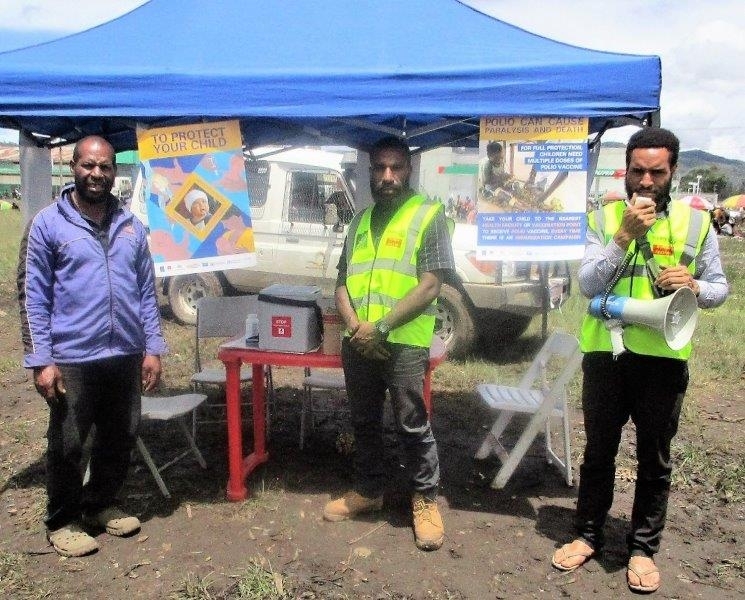 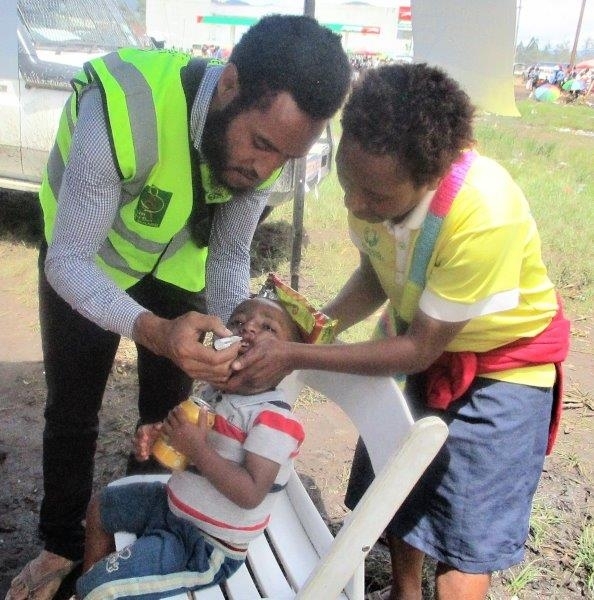 This was then followed by a week of awareness activities in all the districts as well as in Mt Hagen City and the surrounding areas such as Kagamuga Airport, Korn Farm and Kerabug Tech, advising parents to take their children to the nearest clinics and points of vaccination to be immunised. 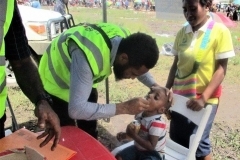 During the awareness, parents were also told that unlike the previous rounds where all children up to 15 years were immunised, the fifth round would only cover young children aged 5 years and below. 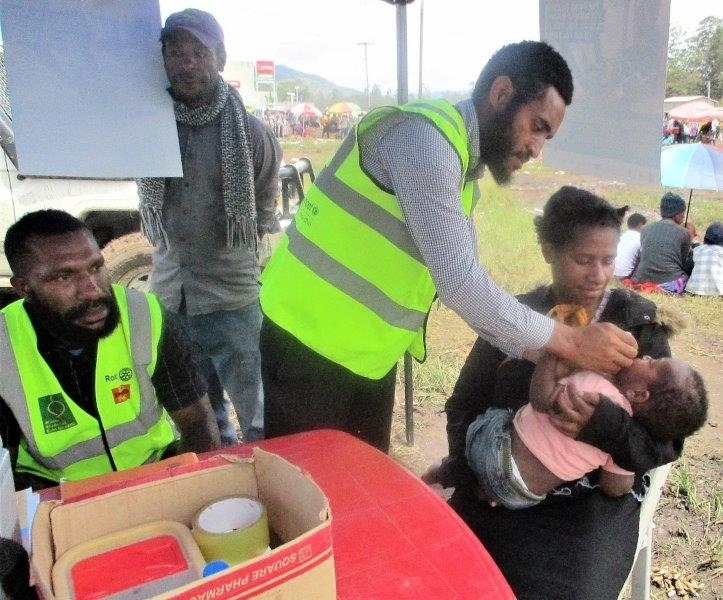 Staff operating the vaccination points were also proactive by stopping parents who walked past them with children and asking if they had been vaccinated. 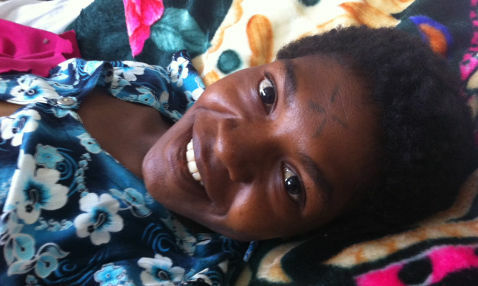 If the answer was negative, these children who could have missed out were also vaccinated. 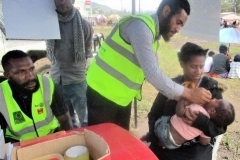 The vaccination points in the city and the districts were clearly visible for parents to identify as all staff operating them wore bright yellow vests which had been donated by Rotary International. 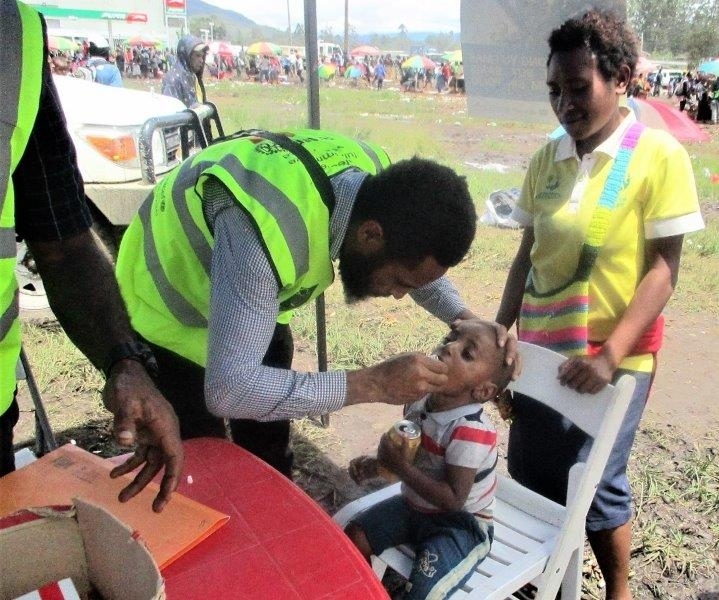 Coordinator of the PEOC, Dannax Kupamu said the vaccination program in Western Highlands would continue until 24th April to enable his staff to do mop up immunisation to ensure all children in the catchment group were vaccinated. 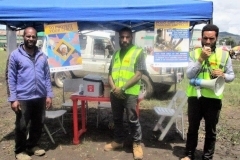 He said coverage of the catchment group (0-15 years) in the Western Highlands during the 4th round was 95 percent and his team was now aiming to reach the same percentage, if not more.